Everyone I know is making a fortune either holding or trading Bitcoin. In all reality, buying Bitcoin and holding it for the long term offers the potential for huge profits without having to stare at order books all day long. However, the potential to double or triple one’s holdings is often just a mere trade away, especially when margin trading. That’s why so many people are giving up their day jobs to trade Bitcoin and altcoins full time. Trading cryptocurrencies is the digital version of the 1849 Gold Rush, where computers and trading software have replaced shovels and sluice boxes. Anyone who is new to buying Bitcoin and trading Bitcoin on exchanges may find it a bit daunting at first. However, trading Bitcoin and other cryptocurrencies isn’t all that complicated after you get past the learning curve. So let’s take a look at the basics of trading cryptocurrencies and then examine the advantages and disadvantages of margin trading. The trading process is relatively the same on any exchange (with the exception of Shapeshift, which simplifies trading immensely). 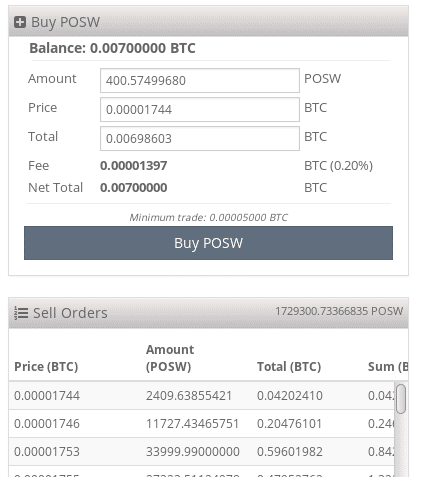 There will be an order book with both buy and sell orders. The simplest strategy involves purchasing a cryptocurrency at its sell price. This means that another trader has placed their order in the book and is willing to sell at this price. While the price for such a trade will be slightly elevated compared to the buy side, the order will execute nearly immediately. Simply enter how many shares you’d like to buy, look at the order total, click “buy,” and confirm the order. That’s it: you now hold this coin. Traders who are looking to purchase a coin at a more competitive price generally place a buy order and wait for someone to sell into them. This is often the strategy that professional traders employ, as patience allows them to secure cryptocurrency for a lower price. However, securing a coin in this fashion clearly isn’t a certainty, as buy orders may never end up being filled, especially if they are far down in the order book. 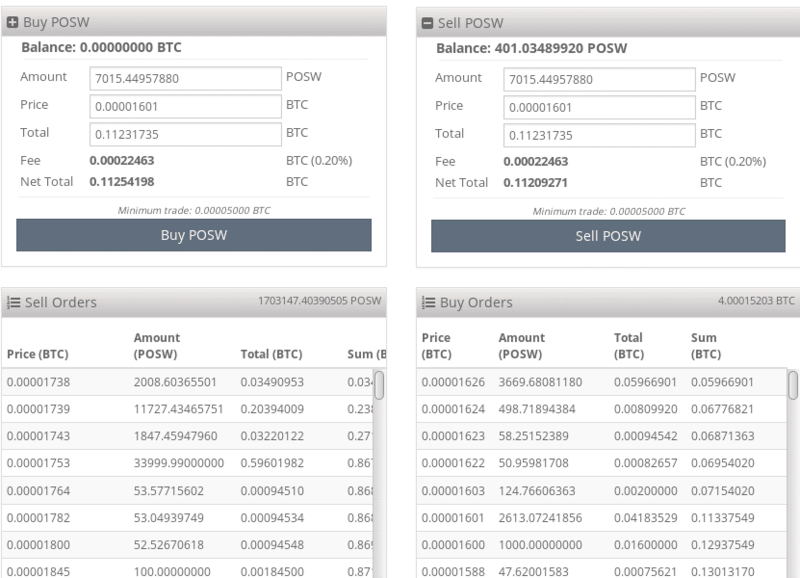 In the example below, I’m looking to buy PoSW for 0.00001601 instead of buying it immediately for 0.00001744. After entering the amount I want to purchase, I click “buy,” and a buy order for that price is shown. Now I wait for a trader to fill my order at this price. The numerical difference between the top buy order and the top sell order is called the spread. Market makers, as they’re called, place both buy orders and sell orders in order to increase market liquidity, ideally making a small profit on the difference in the spread. The biggest reason why so many people are attracted to trading cryptocurrency is its volatility. Prices swing dramatically up and down—sometimes in a matter of seconds. This roller-coaster ride allows traders great potential to earn a profit if they can capitalize on these huge price fluctuations. In order to be successful trading Bitcoin and other cryptocurrencies, beginners must avoid becoming emotional, whether their portfolios are way up or sitting in the red. Traders who use fundamental analysis and technical analysis and understand the risk/reward ratio have the potential to make logical decisions rather than emotional ones. This is what separates professional traders, who earn consistent profits, from beginners, who often lose money. Where Should I Trade Bitcoin? Over the last couple of years, there have been a number of Bitcoin exchanges that either went belly up, were hacked, or faced some sort of regulation issues. Truthfully, no centralized Bitcoin exchange is a safe place to hold your funds. This is why the push for a reputable decentralized cryptocurrency exchange is a big topic of discussion these days. However, at this point, most traders still stick with a few of the top-volume Bitcoin exchanges, as they offer the greatest liquidity and ease of use. Traders should stay away from Chinese-based exchanges, as they are in the process of being closed down by the Chinese government. Right now, the number one Bitcoin exchange in the world in terms of volume is Bitfinex, which sees hundreds of millions of dollars in trades every day. Many traders also prefer Bitstamp, which also has over $100 million in exchange on most days. Others prefer GDAX, the exchange offered by Coinbase, while still others prefer any of the various smaller exchanges that are also available. Most of the big exchanges mainly focus on trading BTC for USD and EUR, but in some cases, they also focus on LTC, ETH, and DASH. Individuals who want to trade Bitcoin for other cryptocurrencies generally choose an exchange such as Poloniex or Kraken. How Do I Begin Trading Bitcoin and Other Cryptocurrencies? First, purchase Bitcoin and move it to your exchange of choice. As soon as Bitcoin appears in the exchange’s BTC wallet, it can be traded—for US dollars, a number of other fiat currencies, or, on some exchanges, a wide range of different altcoins. It’s not advised to keep Bitcoin or other cryptocurrencies on an exchange for a long period of time, but day traders don’t have any other choice. Be aware that this is just one of the many risks of trading cryptocurrencies. One extremely profitable—yet risky—trading strategy is margin trading. This simply means that traders borrow capital at relatively high interest rates to increase their leverage. If things go right, huge gains can be expected. On the other hand, the wrong move could end up breaking traders as they battle high interest rates, margin calls, and order liquidation (meaning that the position is closed at a total loss). There are exchanges that offer 1:1 leverage, meaning that traders can borrow 100% of their holdings. For instance, a trader with a balance of 1 BTC will effectively be able to trade 2 BTC, increasing profit potential. Other exchanges offer 2.5:1, 3.3:1, 20:1, and even 100:1 margins. With 100:1 margin trading, I find myself either up 500% in minutes or liquidated in the blink of an eye. It’s more like playing the slot machines at the casino, so I don’t necessarily recommend it. 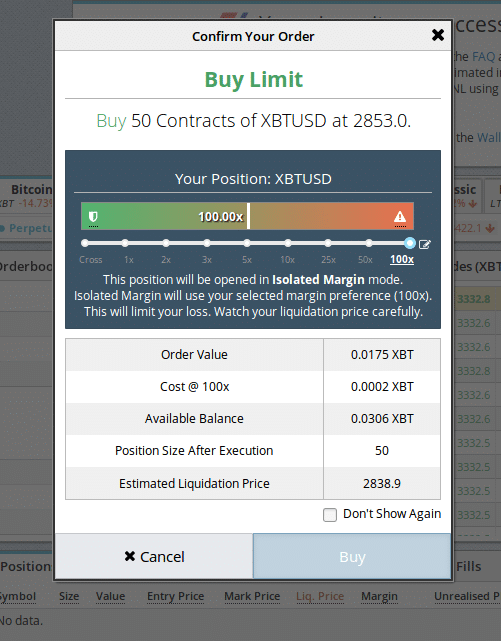 There are two options when margin trading: entering a long position (buying and betting that the price is going up) or entering a short position (betting that the price is going down). Traders who are fairly certain that the price is moving in a particular direction can use margin trading to capitalize to the fullest on correct predictions. When things go right, it’s obvious that traders have the potential to earn a significant sum of money by leveraging capital through margin trading. Traders who understand risk management should be able to avoid losing their entire bankrolls in a few trades, and they have the potential to earn way more money by leveraging capital than they could by using their personal funds only. What Are the Drawbacks of Margin Trading? Margin trading doesn’t come cheap, as borrowed funds are subject to high interest rates. These charges are automatically withdrawn the moment a position is closed out. In addition, trades that don’t go as planned often end up liquidated, resulting in a total loss. If a margin trade goes in the wrong direction, individuals will be required to add funds to their accounts (margin call) in order to avoid order liquidation. If a trader is unable to provide further funds to secure an order, it will be closed out automatically. Bitfinex, CEX.IO, Whaleclub, GDAX, and Bitmex all offer margin trading. Bitstamp will be offering margin trading soon, but for now it’s still in the closed BETA phase. 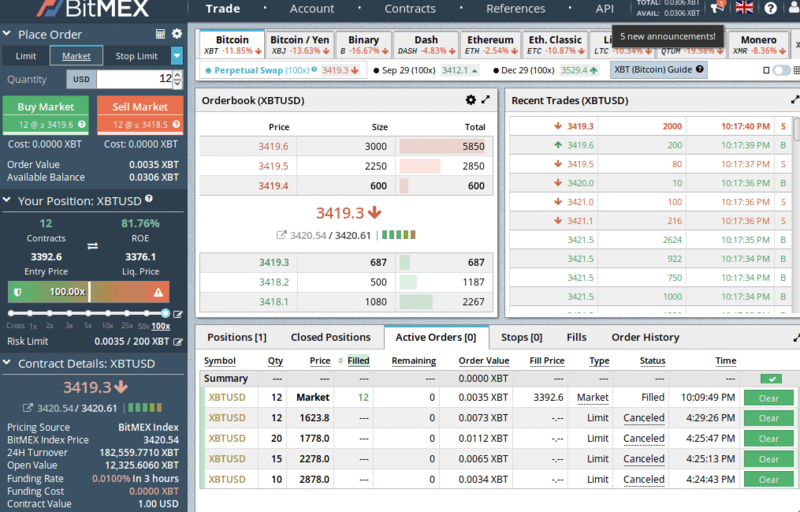 Bitfinex offers 3.3:1 margin trading. Simply put, traders can borrow $7 for every $3 they have in their accounts. Since Bitfinex is the biggest Bitcoin exchange in the world by volume, traders should start there. CEX.IO offers 3:1 margin trading and is one of the most popular options for traders, yet their verification process is demanding. Whaleclub offers 50:1 leverage on cryptocurrencies and 200:1 leverage on forex pairs. This is a great place to be for traders who want to max out their margin trades. GDAX offers 3:1 margin trading. There are a number of hoops you’ll have to jump through before you’ll be able to margin trade, and this platform is geared more toward institutional investors with net worths of more than $1 million. 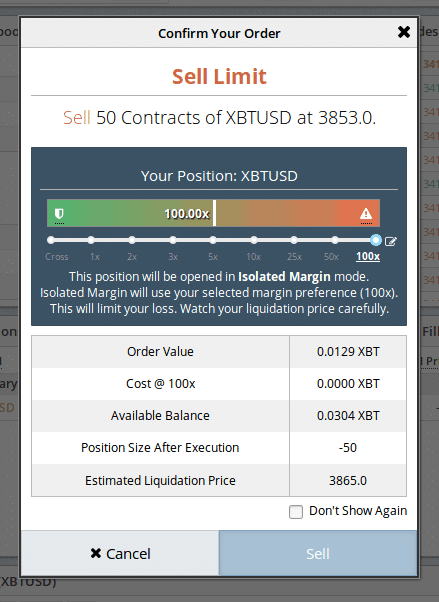 Investors who want to throw all caution to the wind and attempt to maximize their profits may want to margin trade at 100:1 leverage on Bitmex. When things go right, it’s like a rocket ship launching to the moon—yet one small move in the opposite direction will entirely liquidate an order. A word of caution: start by trading small amounts. A bit of risk management is required for traders to ensure they’re getting the most out of their leveraged funds. Beginners should start out trading small amounts at a margin of no more than 2:1. Ideally, never use 100% of funds in any one transaction. For instance, placing $1,000 into an account and using only $100 of personal capital with 2x leverage per transaction would still leave a trader with $900 if their margin trade didn’t work out. At the end of the day, traders have to decide how aggressive they want to be in terms of trading strategy. However, when it comes to margin trading, investors have the potential to earn significantly larger profits than they would with liquid capital alone. Investors who are able to properly manage their margin trades have the potential to profit substantially from the winners while writing off the losers. Is margin trading for you? The only way to really know is to give it a try. Start small and get a feel for how the market moves. I would like to use out of the money options to collar the larger moves. Do you know of anyone who could advise me? Enjoyed your piece Wolff of Blockchain. Informative and broken down quite nicely, Thank you.